The lion or African lion (Panthera leo) is a species of mighty and powerful large felines. These sturdy cats are related to the domestic household kitty, but, for one key difference, are significantly bigger, sometimes weighing upwards of 420 pounds. Big as fully mature lions are, newborn cubs usually only tip the scales at less than 5 pounds. Although adult African lions significantly outweigh almost all human beings, they enter the world much smaller. The diminutive size of the newborn cubs may be because lioness gestation periods are so brief -- generally between 100 and 120 days. When fresh out of the womb, wee lion cubs usually only weigh in the range of 2 and 4 pounds. At birth, their eyes are still firmly shut, and actually don't open up until roughly 11 days later. Lions begin their lives totally without vision. Certain species of animals are capable of walking practically immediately after birth -- think horses, for example. Baby foals generally possess the ability to get up and walk around approximately half an hour after birth. Lion cubs just are not as quick in this department, although they definitely beat out humans. Tiny lion cubs generally are able to fully walk when they reach around 15 days old, according to the University of Michigan's Animal Diversity Web, although some may be able to walk a little bit sooner than that. Although tiny lions may certainly be able to get up and walk around at approximately the half-month mark, they're usually not ready to run at that point. Cubs usually gain the ability to run when they're roughly a full month in age. 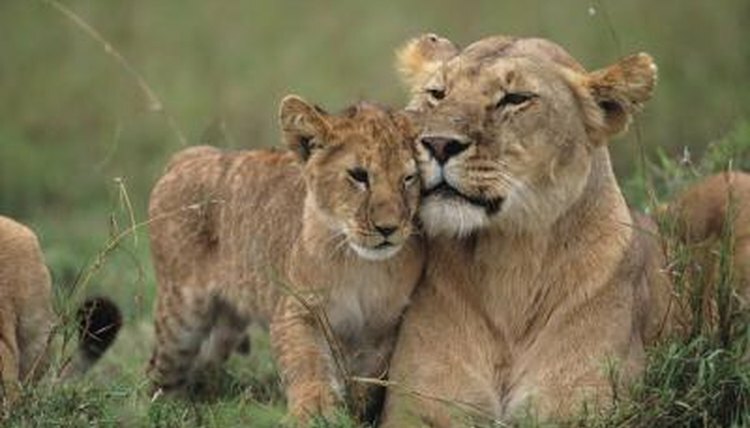 Female lions generally give birth to somewhere between two and three baby cubs at a time. However, litters can be as small as one cub, and even as big as six of them. Lion cubs typically enter the world in isolation, and do not meet the rest of the pride -- the lion social group -- until they're at least a month old and fully capable of both walking and running. Hunting activities typically start when cubs are only 6 weeks old. The little ones learn by closely observing their mothers. They rely on the care and assistance of the elders in their pride until they're a minimum of 16 months in age.